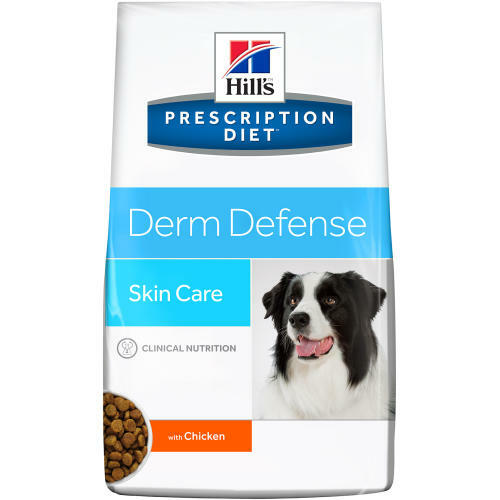 Hills Prescription Diet Derm Defence is the first & only clinical nutrition formulated to support skin function in dermatosis due to environmental causes by maintaining normal immune system and helping the skin barrier against future episodes. HistaGuard complex, a proprietary blend of bioactives and phytonutrients. Continuously maintains normal immune system with natural sources of polyphenols. Supports skin health with Vitamin A, zinc and essential fatty acids. Dampening the immune response to environmental allergens by suppressing histamine release. Maize, brewers' rice, chicken (17%) and turkey meal, maize gluten meal, digest, dried whole egg, soybean oil, flaxseed, animal fat, dried beet pulp, fish oil, minerals, vitamins, taurine, trace elements, and beta-carotene. With a natural antioxidant (mixed tocepherols).